A fine overview of Antarctic Exploration in the middle part of the 19th century. An excellent 1855 first edition example of Colton's map of the South Pole, Antarctica, or the Southern Polar Regions. 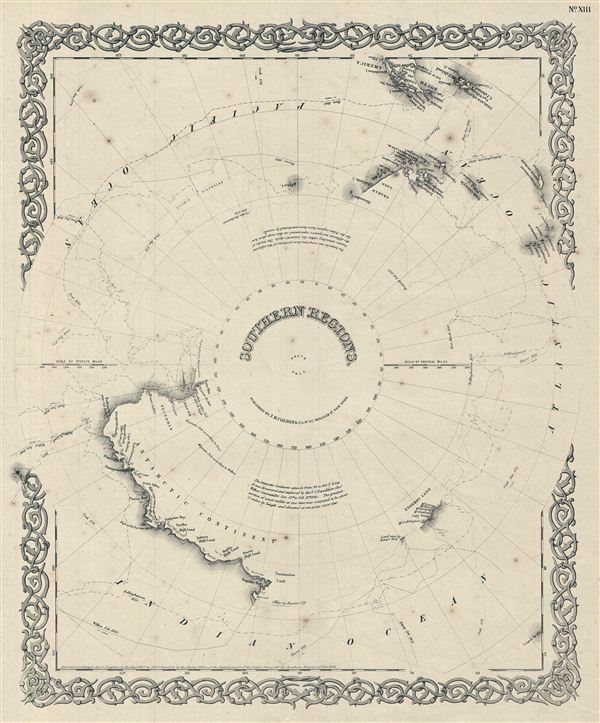 Colton's map offers an excellent overview of the state Antarctic exploration and discovery around 1855. The southern continent is mapped only tenuously reflecting an overall lack of knowledge regarding the region. even so, Colton notes the travels of a number of important Antarctic explorers including Wilkes (1840), Bellinghausen (1820), Ross (1840 - 1843), KIempt (1833), Cook (1773 - 1774) and Biscoe (1831). This map also identifies some additional cartographical details Tierra de Fuego. Surrounded by Colton's typical spiral motif border. Dated and copyrighted to J. H. Colton, 1855. Published from Colton's 172 William Street Office in New York City. Issued as page no. XIII in volume 2 of Colton's 1856 Atlas of the World. Very good. Blank on verso. Even overall toning. Minor stains ovreall. Rumsey 0149.010 (1856 edition). Phillips (Atlases) 816.